A Bayadere is an Indian female temple dancer – the word is originally Portuguese – and in Kálmán’s operetta a famous soprano, Odette Darimonde, has promised to play the title role in an operetta of that title at the Théâtre du Châtelet in Paris. The Indian Prince Radjami visits the premiere and falls in love with Odette. He wants to marry her but she turns him down – even though she is not uninterested. But the Prince refuses to give up Odette and visits every performance for three months. On the 90th evening the theatre director offers the Prince the role of the Indian prince – but only in the last scene. Odette knows nothing about this but falls in his arms and both are overjoyed. There is a secondary love story as well. Marietta is married to Louis Philippe but becomes interested in Napoleon, when he claims to know Prince Radjami. She divorces her husband and marries Napoleon. But after some time she realises that Louis Philippe has been very successful as a business man and when she runs into him she decides to leave Napoleon and remarry Louis Philippe. This is a typical operetta plot and Kálmán has treated it with all his considerable compositional skill. We know his formula: a substantial dose of Viennese waltz spiced with Hungarian czardas and opulently scored with Puccini and Tchaikovsky as mentors. 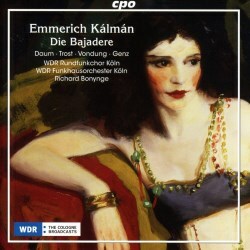 In Die Bajadere he also adds a spoonful of Oriental herbs in the manner of Delibes’ Lakmé. The outcome of this is a delicious dish, fragrant and tasty, and since Kálmán was one of the greatest tunesmiths of his time, we are in for a great evening. We need not bother much about the plot if we don’t want to and the presentation here is not very helpful either. There is a synopsis, sort of, with a general outline but with no cues to specific numbers, and the spoken dialogue is cut out which is just as well. What we have on these two discs is a string of pearls of highly attractive melodies: a smashing orchestral introduction, some choral music, several duets, a couple of solos and two great finales. You may not know any of the music but you will definitely feel at home from the beginning. Kálmán’s music is easy to love. Richard Bonynge has a well-documented interest in the byways of romantic opera and operetta, and he is no newcomer to Kálmán. Some fifteen years ago he conducted a highly successful Gypsy Princess for Naxos (review, review) and here at 84, he is just as vital and inspirational. On that recording the composer’s daughter, Yvonne Kálmán, took part in a speaking role, and on the present recording she also appears as the wife of the theatre manager. It is wonderful to have this link directly back to the originator of this music. The cast is excellent. Heike Susanne Daum is a splendid Odette with her bright, beautiful soprano and her easy high notes, and the excellent Lieder-singer and Mozartean Rainer Trost is an elegant, polished Prince Radjami. The second couple is also a real hit. Anke Vondung’s (Marietta) rounded mezzo-soprano matching Stephan Genz’s (Napoleon) lyric baritone. Listen to their first duet Treu zu sein (CD 1 tr. 2). This is operetta singing on a level one can’t take for granted. Miljenko Turk as Louis Philippe is another good baritone. There is a lot of background material in the liner notes and quite extensive artists’ bios. The recording is excellent – they obviously spent ten days in the recording studio! – not what we expect today when most opera and operetta recordings are made at live performances. Those ten days were really well spent and resulted in this valuable addition to the operetta repertoire on discs. There was once a recording of an English version of this score, but here we get the original. A wholly charming operetta excellently performed. Not to be missed by operetta lovers!